There are constant trends in the brewing industry: collaboration, community, family and, of course, beer. Black Hat Brew Works espouses all of these themes in one tidy package in a Bridgewater industrial park. Brothers Paul Mulcahy and Scott Galpin have turned their brewery into a hotspot for locals in just three years. Located just off Route 24 on Pleasant Street in Bridgewater, just a short hop from Route 495, Black Hat is a stop to make whether or not Bridgewater is your final destination. You just can’t go wrong when you feature good beer, good food, and great atmosphere. On Thursdays, Fridays, and Saturdays, the brewery hosts local food trucks, making for an excellent night out. Favorites include Holy Moly Pierogis, Bella’s Catering, Baby’s Bonetown BBQ, and Los Jefes Next Level Eats (try the Cuban Sandwich with a Black Hat IPA!). The schedule is on the brewery’s Facebook page, and you can expect all of them; plus Fiamma Bella Pizza, the Bearded Chicken, and 10B Pasta Co. through the month of August. The food truck connection came about at one of the town’s Christmas on the Common celebrations, where the brothers ran into the owners of Fiamma Bella Wood Fired Pizza and exchanged ideas. The brewery had just finished construction of its outdoor patio, complete with a heating system and a couple of very comfortable couches, and wanted to add food to the list of services. It was a perfect match, and Paul says it has worked out for all involved. Black Hat also boosts the local brewery scene by way of its yearly South Shore Farmer Brewfest each September (2018 date to be determined), the proceeds of which are donated to local charities with the help of the town’s police and fire departments. Last year, despite a rainy start, the fest saw over 700 guests enjoy beer, food, and music, all based on the South Shore. This year’s event may be even bigger. Black Hat offers a number of beers on draft, rotating through some old favorites and some small batches of new and delicious ideas. Bridgewater Blonde, the flagship, is a light-bodied blonde ale, sweet and malty, and 6.5% ABV. The Belgian Tripel nails all the points a beer should have: high alcohol (11.2): check; drinkability: check; a gentle spice character in the aroma and flavor: check; and it’s a delicious, well-crafted version! The 22IPA calls back to the days of drinkable IPA’s, with a clarity in both appearance and flavor. The hops shine through as a counterpoint to the malt backbone, with the bitterness light and in balance. Also available recently was the dark Goat Herder Stout, featuring Shea’s Coffee, a roasty, solid stout, with a “fresh cup of joe” flavor right up front; and the Ambah Ale, which features a smooth mouthfeel, clean flavor profile, and a solid malt base–perfect as a “go-to” beer. Paul and Scott started making beer as part of a Christmas gift trip to Deja-Brew, a brew-on-premise operation located in Shrewsbury, almost a decade ago. The pair had so much fun, they made it a regular occurrence, even putting together a “Brew Crew” of co-workers to make the trip up and brew together. It didn’t take long for the pair to get to work on their own homebrewing system (a SABCO Brew- Magic; Black Hat now owns two of these systems, modified for larger batches), and it was a short jump from there to having friends and family start asking for specific repeat beers. “When are you gonna make this one, or that one again?” Paul relays over beers in the brewery’s taproom. The constant requests sparked the idea that maybe the brothers were on to something. Paul and Scott worked closely with the town to get the brewery open. They had a deadline in mind, and Bridgewater officials were “as excited as we were” to see it to fruition. It helped that the town was receptive to the idea of a brewery, and that Paul and Scott met with town officials early in the process, creating lasting relationships. The brothers were able to get in on the ground floor of their building construction process as well (they are one business in a strip of three or four others) and were able to put essential brewery building features in before the building was erected, making the buildout process of the brewery that much smoother. There was a snag, however. The brothers had a grand plan of opening Black Hat Brew Works on, what they called “Black Hat Friday,” the Friday after Thanksgiving, in 2015. The building wasn’t ready for the other businesses, although the brewery was, and that meant the occupancy permit was delayed. 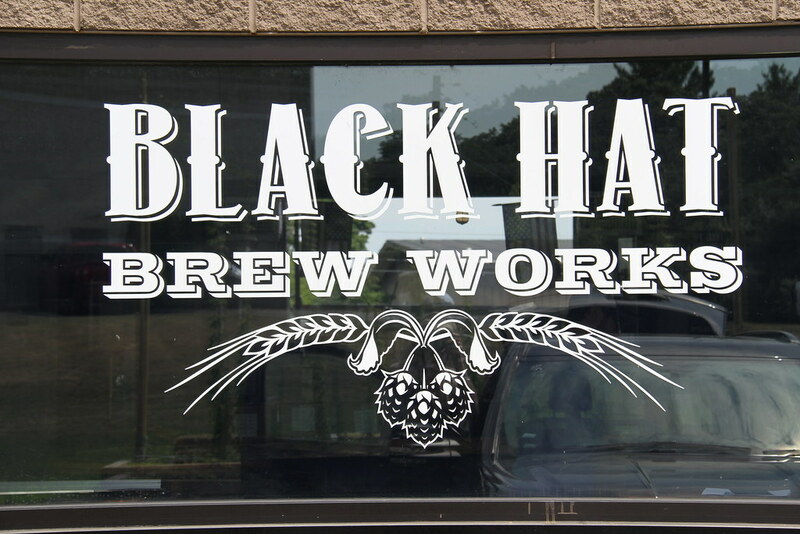 A special inspection of the brewery the morning of “Black Hat Friday” led to a temporary occupancy permit being issued, allowing the brewery’s plans to fall into place. The brothers continued their collaboration with local businesses when they went looking for brewing ingredients. As part of the “Farmer- Brewer License”, the brewery operates under, the state requires that each brewery source some of its ingredients locally. While many breweries use locally grown grain or hops to satisfy this requirement, Black Hat turned to Simpson Spring, in Easton, to supply their water. “Water is the base for everything,” Paul says, “and although we modify the mineral contents of our water to fit each style of beer we produce, having Simpson Spring supply us with the base is one of the best decisions we could have made.” Simpson Spring is the oldest bottling plant in America and home of one of the oldest commercially used springs. Collaborations within the town were tackled with the same ingenuity. Aside from the normal brewery swag, the Black Hat tap room also offers some unique items that were created by working with other Bridgewater-based businesses. Woofy Biscuits, a pet treat manufacturer, now bakes up dog treats made with the brewery’s spent grain. Mike Shea’s Coffee has produced a special dark roast that is used in the brewing process for Black Hat’s stouts and is packaging a Black Hat Dark Roast for coffee lovers as well. In addition to the brewery and tap room, you can find Black Hat beer at over 20 South Shore restaurants and bars, including Stoneforge Grill in Easton, The Riviera Brewhouse Café in Bridgewater, 2 Jerks BBQ Kitchen and Bar in Raynham, Buddy’s Pizza Pub in Middleboro, and Grand Slam Pizza and Pub in West Bridgewater. Matt Foster is a South Shore-based beer nerd. When he’s not drinking beer, or writing about drinking beer, he spends time with his lovely wife and two children, where he’s thinking about drinking beer.